Gabrielle Smith – aka Brooklyn's Eskimeax – is probably a lot like you: her first recordings were made DIY-style after she adopted the moniker as an outlet for her experimental and noisey sounds. As time progressed, she founded the Epoch Collective as a home for other Brooklyn-based creatives and honed her own pop skills. Nowadays, she's playing bigger and better venues and even had her debut album, O.K., which was released on Double Double Whammy, included on NPR's All Things Considered's Top Albums of 2015. Not a bad feat for someone who started from humble beginnings, right? It probably helps that she's got opportunities in her own backyard, like the borough's own Northside Festival, to help her propel her dreams. We couldn't resist asking her about her career, what it's like to be part of that very music scene, and how Northside helped her gain traction as an artist. (Psst, you can also play Northside! Apply here by April 18.) Here's what she had to say. 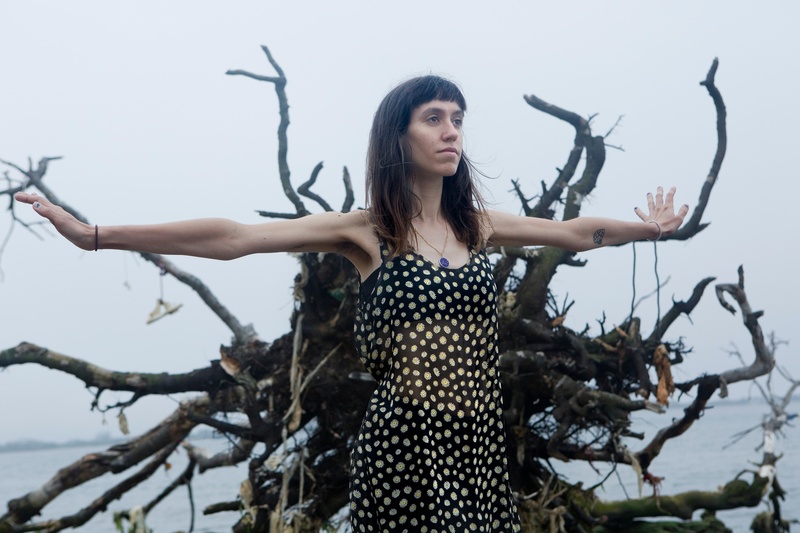 How long were you songwriting and producing for before you started Eskimeaux in 2007? I had a couple of bands before I started Eskimeaux, for which I was writing pretty terrible songs and learning how to make my way around the guitar. The beginning of Eskimeaux was really my first experience actually thinking about songwriting, arrangements, and structures. I was pretty depressed, like mostly just lazing around my house and occasionally helping out my roommate with the recording studio he had built in our house. One day, my ex, who I was also living with at the time, accused me of "never doing anything." I was like, "Yeah I do stuff! I... have an album!" So then I had to make an album. What are the pros and cons of home recording vs. a professional studio? Eskimeaux actually has never been to a professional studio; all of our albums have been written and recorded in home studios. I mean, the pro of home studios is the amount of time you can spend tinkering with ideas. Studio time is money, so unless you have a lot of money, it has to happen quickly. The con is that my home recording space isn't sound treated/proofed, so when I record, it just sounds like my room, which isn't necessarily best for mixing later, especially since I tend to work with a huge amount of tracks (due to the aforementioned tinkering). I'm hoping to bring our next record to a professional studio, though! The Brooklyn music scene is very saturated. What do you do to stand out, and what were some key moments that helped you work your way up? It is very saturated, but we've found a really nice community that we are really psyched and proud to be a part of, which seems – maybe because of it being such a nice community of people – to have a lot of eyes on it recently. I mean, really, it's just that we work really hard (we play shows almost every week and are constantly having band practices and writing new songs). I guess the most key moment was getting to work with Double Double Whammy. They are such a cool label, so it gave me a huge boost of confidence and inspiration to be asked to work with them. I think, as a result, we really rose to the occasion with the record and stepping up our live performances. In what ways has being from Brooklyn impacted you musically? Having access to the super-talented, inspiring people who live here, whether it's getting to work with them or see them play as often as I do, has been super important to my growth as a musician and songwriter. What do you think makes the Brooklyn scene unique? What do you personally love about it? I think getting to attend all of the awesome, free shows that happen in the summer have shown me how to be a dynamic performer. Also the fact that all of my favorite venues are within a very close, walking-distance proximity to one another, so I can bounce between their usually rad shows on the same night if I want to! What were some highlights of your Northside Festival experience? What was the vibe of the event? I attended the first-ever Northside Festival with Mount Eerie, Wyrd Visions (my favorite set of the whole festival! ), Sharon Van Etten, Guided by Voices, and Beirut (and obviously a ton of other bands). It was also the first festival I had ever attended. It was really exciting to me! So it was super exciting the first time I got asked to play. I think the first Northside show I played was at Trash Bar. No one came, but it was still cool to get to be an ~official artist~. Last summer we played the Urban Outfitters stage to a ton of surprisingly silent people on Bedford Ave. It was awesome! How did you adapt your electronic-heavy recordings to a live band situation for the fest? What was the biggest challenge? For our live setup, we strip each song back to its demo form, which is just me and guitar, and rebuild it from there using the instruments we have (electric bass, MicroKorg, and drums). We work hard to make sure that each song is super dynamics heavy and exciting to us as the players so it can translate to a good experience for the listeners. I think our biggest challenge has been the song "Broken Necks." It's a really lush recording, and it's hard for me to divorce my expectations from that to perform it live. But we overcome it by trying to make the actual experience of the song exciting, calling upon the audience for participation, as well as doing dances to keep the vibe fun. I think it comes across well! To you, what role does Northside play in the Brooklyn music scene? And what kind of a role does it play for you personally as a local artist? I think Northside provides a cool concentration of great bands in one zone. The summer is a time when most people are excited to be out at night, and it's fun to hop from show to show seeing great music! What's your best advice for an indie artist or band hoping to play Northside this year? The staff is really nice! If you don't get a chance to play this year, definitely take advantage of the opportunity to catch great bands, and talk to people at the shows! Ask around and see who was in charge of setting up the show you're at. Also, make your live set noticeable during the year by being as tight and exciting as you can be. That's how I got asked to play, I think! Want your own chance to steal the spotlight at Brooklyn's Northside Festival in June? Snag one of 35 slots specially set aside for Sonicbids artists. But hurry - applications close on April 18!